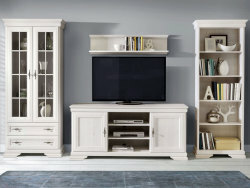 Living room furniture in the best tradition of the leading manufacturers! 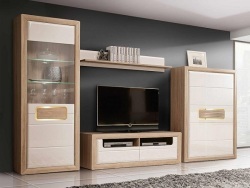 Wall, slides, living rooms, display cabinets, coffee tables, modular furniture in our online store for those who want to buy quality furniture for the living room at the best prices in Ukraine. 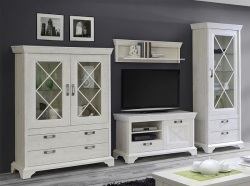 Choosing furniture for the living room, each of us is guided primarily aesthetic moments and then thinks functionality chosen furniture. Living room - a room in which we enjoy going to the family to spend the evening watching TV, receive visitors, and therefore relevant to the situation in this room is very serious. 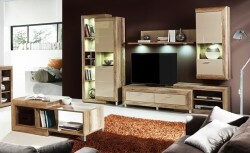 Living room furniture should be beautiful, comfortable and at the same time emphasize your personality and preferences. Someone who likes minimalism and comfort, fills the space of the room soft furnishings and complements some elements. 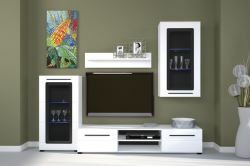 It can be angled and straight glass windows, mirrors, racks, shelves, stands for flowers and various decorative elements. Others prefer the classic version filling his living room, wanting to beat her up nicely, but to be sure the furniture was functional. In this case, good wall, and modular seating system. 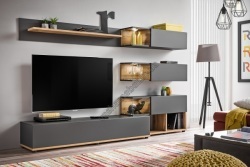 If you chose the living room, then place it along one wall, and at the same time you have a niche under the TV cabinet, bar, bookcase, wardrobe and various mezzanine and offices for linen. Selecting a suitable modular system, you get to put all these elements as you want.